One of the first articles I wrote for this site was about how to use loss aversion to get people to buy Xbox Live Arcade or Playstation Network games. The idea was that during the demo for the game you award people achievements or trophies, then threaten to take them away unless they buy the full game. I speculated that this would result in increased sales because of how people hate to lose something once they have it and simply owning something can inflate how much we value it. I’d be fascinated to see what this does to Crackdown 2’s sales numbers and how many people actually end up shuffling achievements over from the demo. It’s a great idea regardless, but it’s worth noting that it’s not quite what I had in mind in my earlier article. What I thought would be most effective was actually giving the person the achievement and associated gamer points so that they show up everywhere you normally see them, then taking them away if the person exited the demo without buying. What Ruffian did was just say “you earned these in the demo, we’ll give them to you in the game, too.” It’s not quite the same thing, because it doesn’t trigger the idea that you’re going to lose something unless you act. Well done! You have unlocked the following achievements and earned the gamerscore points that go with them. They are waiting to be added to your account once you purchase the full version of Crackdown 2. If you don’t, these achievements will be lost forever. Don’t let that happen, Agent! I bet that would have worked out a lot better, given how it casts the achievements as a potential loss rather than a gain, and we react much more strongly to losses than gains. What about you? Are you more likely to buy the game because you’ll get to keep your achievements? It’s also worth noting that the one thing I really hated about the demo was the timer that forced you to restart (with a fresh game and a wimpy Agent) after just 30 minutes of play. Again, I wrote before about how people –especially Westerners– hate the idea of being on a meter and experiencing their service or product as a series of little losses. Of course, the Crackdown 2 demo doesn’t perfectly fit the bill here since you’re not paying for it, but the human brain isn’t always rational and I bet that my distaste for the timer is partially due to the flat rate bias. 1. If not reading this site –HI GUYS! SEND ME CRACKDOWN 2 SCHWAG, PLZ! That post stuck with me and I thought about it when I saw the achievements in the CD2 demo. I wonder if we can cajole MS into making the conversion data available. It won’t prove that the strategy worked, but it would be interesting to see anyway. Good stuff. Intuitively I’d say I’d react much more strongly to your version of the text than theirs. While playing the demo you also could have something like a counter ticking to zero for every or all achievments – THEN you loose one or some more achievments and the – maybe – related advantages – even if you buy the game later. This means the user has some kind of pressure of time. Jamie, I thought of your post when I saw that screen too! But I think Ruffian have probably pitched this about right by describing the achievements as an unfulfilled potential gain rather than a loss. While the sales pressure on the player could be strengthened by actually awarding the achievement and then taking it away, it would work by turning a positive sensation – the anticipation of gain – into a negative one – loss. At some level of consciousness, players would feel angry about losing the achievements they had “earned”, even though they hadn’t paid for the game; just as the demo timer bugged you (and me! ), the conscious knowledge that the demo was free would not entirely mitigate the emotional response. No doubt Ruffian doesn’t want to burn too much positive consumer sentiment for a small increase in sales. Your last suggestion would stop short of irritating customers, but it’s also a bit misleading. The potential achievements aren’t really “lost” because they never get deleted; you can buy the game at any time and they’ll still be there waiting for you. 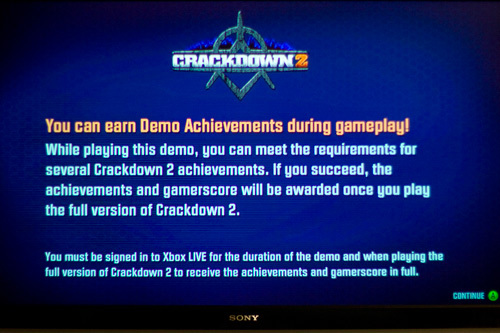 What about a flat out “demo only” achievement? Play the demo for a certain time or accomplish a certain feat, and you’ll get the credit. When you play the real game, you get an achievement. Wonder what that would do? Not sure that M$ would like it or not, but that argument aside, I wonder what the ramifications of such a setup would be in the long run? Would people play more demos thinking “I’ll do enough for the demo achievement” then end up maybe liking/buying the game? 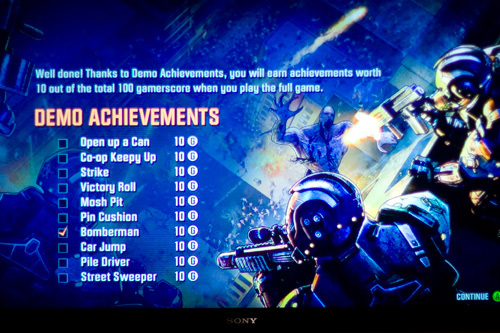 I think these demo obtained achievements were bound to happen. Sony is doing the exact same thing with their Game Trial service with their PlayStation Plus games, but apparently all of those will be limited to 1 hour of play, but claim that all save data and trophies will carry over to the full game when purchased. I imagine that having the achievements/trophies totaled with other normal game achievements is ideal for eliciting a desire to purchase the final product, but I really do think that it is a certification issue or that the system for displaying achievements is not designed to have them removed. At the same time, I personally having no affinity for achievements or trophies feel that it is a meaningless addition to a demo. I feel like that is a minority opinion though. There is a way for a demo to elicit a response to loss aversion is that is when actual game progress can be transferred from a demo to a full game. This is surprisingly rare on console game demos, but there have been a few notable handheld demos on the PSP that have allowed me to play a game as much as I want (no time limit), accrue items, experience, levels, etc., then lets you carry all of that progress over to the final game. Both the demos for Phantasy Star Portable (and it’s sequel) and God Eater allowed for this and I definitely felt my time investment in the demo would be meaningless if I didn’t buy the full game. I felt like I head a head start in the game and thus may be able to play through the full game faster or what not. There were limits such as a level cap or what areas and features of the gae you had access to, but it was enough to make me play the demo for hours and ultimately (in the case of Phantasy Star Portable) purchase the final version. I would be happier if more games followed this model of carrying over game progress than try to dangle the carrot of achievements in front of me. Then again these two ideas can simply go hand in hand, and then everybody wins. I’ve been reading your website for a while now and knew about loss aversion and still ended up buying Deathspank so I wouldn’t lose out on the Avatar award. of pets, Zodiac Online provides a wide range of choice, with all wild monsters available for capture.